When it comes to restaurant supply food trays, no one compares to our service level. We have been selling paper food trays, foam trays and plastic food trays for over 40 years in Georgia. Food courts in the malls buy their plastic food trays from us, caterers buy their disposable serving trays from us for weddings and banquets, and concession stands and ballparks buy their disposable paper food trays from us for serving fries, hotdogs, hamburgers, and more. 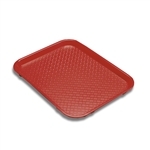 Serving Solutions Fast Food Tray Red - 10 in. x 14 in. Cambro Plastic Oval Serving Tray Black 22 in. x 26.88 in. Cambro Round Plastic Brown Non Slip Tray 11 in. Cambro Round Plastic Brown Non Slip Tray 14 in. Cambro Round Plastic Brown Non Slip Tray 16 in. Cambro Plastic Round Serving Tray 16 in. Cambro Fast Food Tray Brown 11.88 in. x 16.13 in. Cambro Plastic Fast Food Tray Brown 13.81 in. x 17.75 in. Cambro Round Plastic Serving Tray Black 14 in. Cambro Plastic Round Serving Tray Black 16 in. Cambro Oval Plastic Serving Tray 22 in. x 26.88 in. Cambro Craberry Fast Food Tray 11.88 in. x 16.1 in. Serving Solutions Fast Food Tray Blue - 10 in. x 14 in. Serving Solutions Fast Food Tray Brown - 10 in. x 14 in. Serving Solutions Fast Food Tray Burgundy - 10 in. x 14 in. 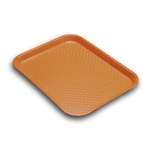 Serving Solutions Fast Food Tray Orange - 10 in. x 14 in. 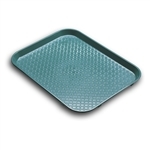 Serving Solutions Fast Food Tray Teal - 10 in. x 14 in. Serving Solutions Fast Food Tray Brown - 12 in. x 16 in. Update International Fast Food Tray Black - 12 in. x 16 in. Update International Fast Food Tray Red - 12 in. x 16 in. 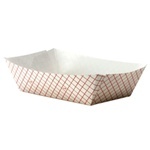 Disposable paper food trays are a critical foodservice product used in concession stands and restaurants. You can also buy plastic fast food trays at wholesale prices here for your food court or restaurant. And of course schools buy their school trays for their students here.